Published: Feb 11, 2019 · Modified: Apr 11, 2019 · By Jen Sobjack · This post may contain affiliate links. This incredibly delicious chocolate cake recipe features the softest cake with rich chocolate flavor covered in a silky chocolate frosting. I often like to perfect basic recipes like vanilla cake, scones, vanilla buttercream, chocolate buttercream, and chocolate cake. Once you have a great base recipe, you can adapt it in so many ways. 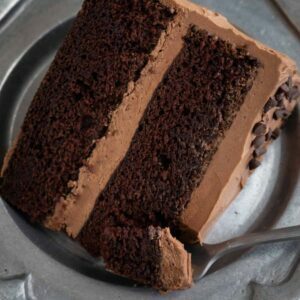 Today’s chocolate cake is definitely a classic. It’s rich, moist, and made completely from scratch. So what makes this cake better than all the other chocolate cake recipes? The texter! And it all comes from the brand of flour I use. 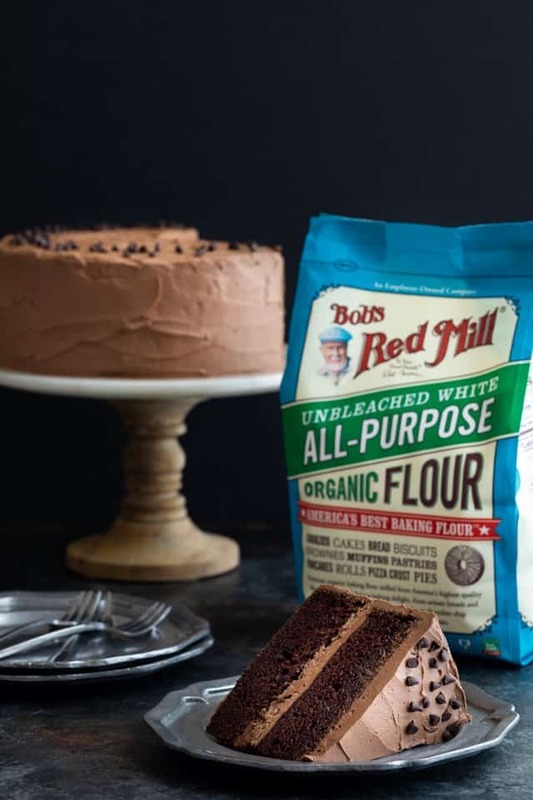 If you’ve clicked around the ingredient links in my recipes, you’ll notice I always link to Bob’s Red Mill products, especially the organic all-purpose flour. It’s a premium baking flour that’s unbleached and unenriched, with no potassium bromate added. It never fails me and yields the best results. I simply can’t recommend it enough! 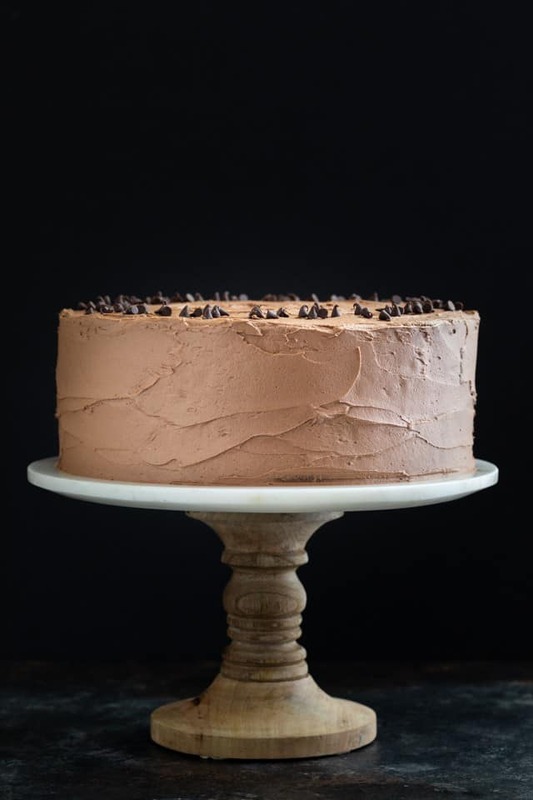 For this perfect chocolate cake recipe, I started with my favorite cake which I used for my chocolate coconut cake and made several changes to get a lighter, fluffier cake. I couldn’t be more pleased and you are going to feel the same way after just one bite. 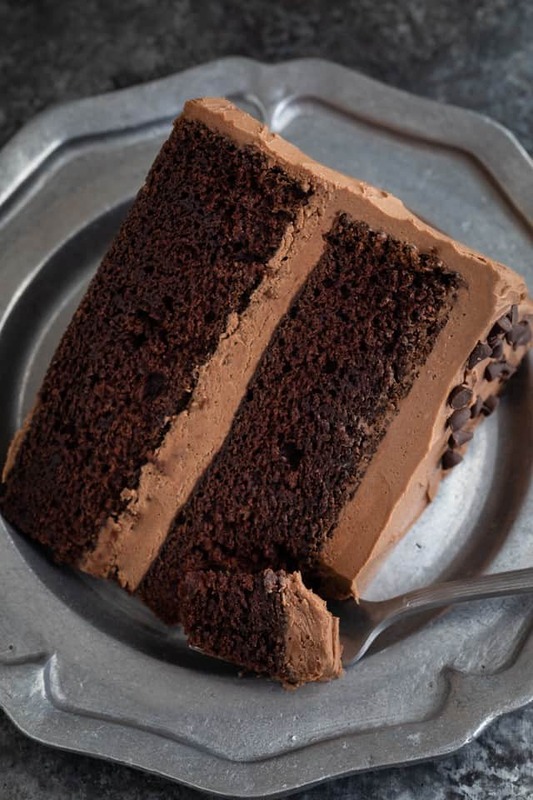 The key to getting such a rich chocolate flavor in cake is to use melted baking chocolate, cocoa powder, and espresso powder. Don’t worry, you can’t taste the espresso powder. It simply enhances the chocolate. But, if you are worried about caffeine, you can use instant decaf coffee powder instead. Begin by preparing the batter. Butter and sugar are mixed together first, then melted chocolate and eggs are added. Combine flour, baking soda, baking powder, and salt then add it to the chocolate mixture. Mix it just until it’s almost fully incorporated. Combine cocoa powder and espresso with water and add it to the cake batter with oil and sour cream. Mix it all together until well combined. The batter should look mousse-like and shiny. 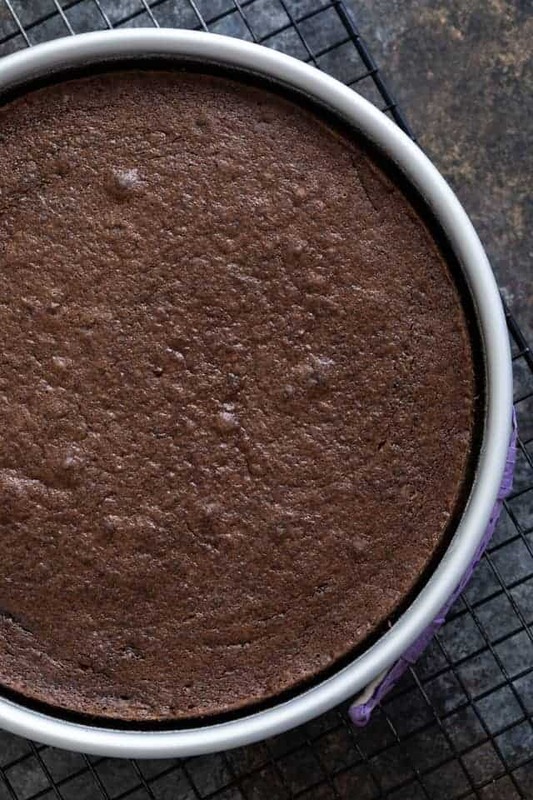 Bake the cake in two 9-inch round pans then let them cool completely before frosting. 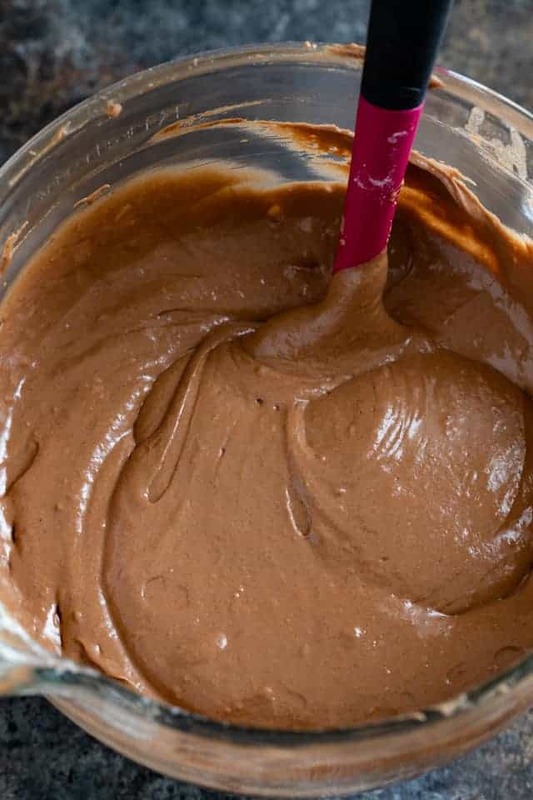 The chocolate frosting is my favorite and I have an entire post dedicated to how to make the best chocolate frosting. So be sure to pop over and take a look before you begin. How to make a moist cake? 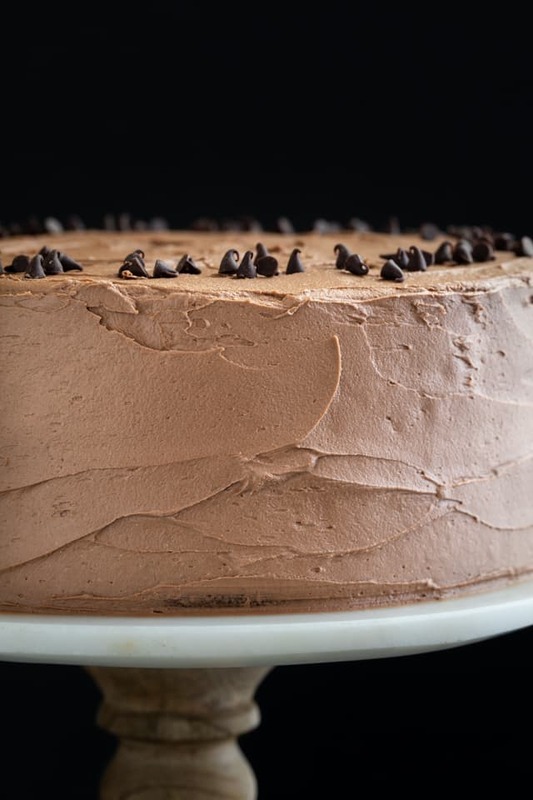 Dry cakes are the worst and chocolate is notorious for drying out a cake. To solve this problem, use butter AND oil. This recipe calls for both but if you make any other chocolate cake recipe, try swapping 20% of the butter for oil. You’ll be amazed at how moist the cake turns out! Another way to keep the cake moist is to avoid over baking it. It takes about 25-30 minutes to bake but oven temperatures can vary so start checking for doneness at around 20 minutes. Use the toothpick test and remove the cake as soon as the toothpick comes out with a few moist crumbs attached. How to bake flat cake layers? I loathe having to trim the tops of my cakes to make them flat. I feel like it’s such a waste. Instead, I wrap wet tea towels or bake strips around the pans. This helps to distribute heat evenly allowing the cake to rise in one flat, even layer. Bake strips can be found online or at hobby and craft stores. 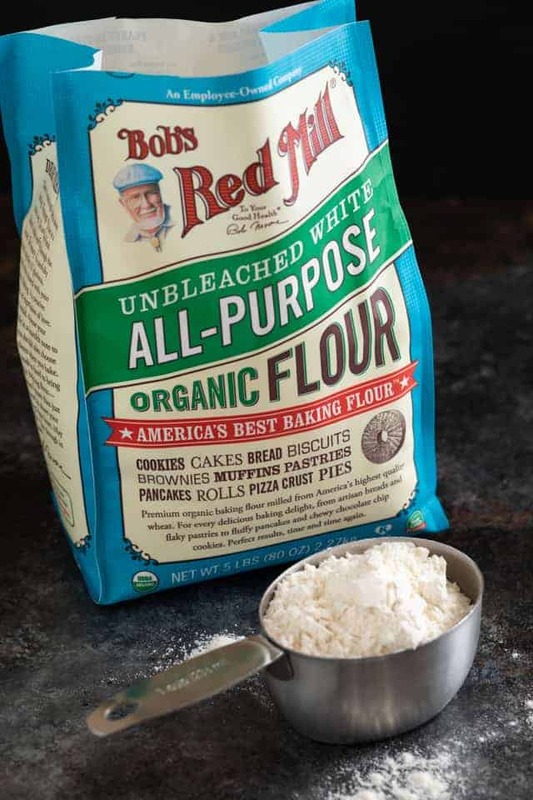 Gluten-Free: Use Bob’s Red Mill Gluten Free 1-to-1 Baking Flour to make the best gluten-free version. Swap the espresso powder for instant coffee granules. You can use regular or decaf. Make a three layer cake with three 8-inch round cake pans. Bake them for 20-25 minutes. Make 24 cupcakes with 2 muffin tins lined with paper liners. Bake them for 15-20 minutes. Heat the oven to 350°F. Grease and flour two 9-inch round baking pans and line the bottom of the pans with parchment paper for easier removal of the cake. Set aside. Add the chopped chocolate and oil to a microwave safe bowl and heat in 30-second intervals, stirring after each one, until the chocolate is melted and smooth. Set aside. In the bowl of a stand mixer fitted with the paddle attachment or in a large bowl with a handheld electric mixer, beat the butter and sugar together on medium-low speed until light and fluffy, about 5-7 minutes. Pour the melted chocolate into the butter mixture and beat on medium-low speed until fully combined, about 1 minute. In a medium bowl, combine the flour, baking soda, baking powder, and salt. Stir with a whisk and add to the chocolate mixture. Mix on low until the dry ingredients are almost fully incorporated. Add the espresso mixture, sour cream, and vanilla to the batter. Beat on medium speed for about two minutes; the batter will be thick and mousse-like. Pour the batter evenly into prepared pans. Bake in preheated oven for 25 to 30 minutes or until a wooden toothpick inserted in center comes out with a few moist crumbs. Let the cakes cool in the pans on a wire rack for 10 minutes. Remove the cakes from the pans from pans, discard the parchment paper, and let the cakes cool completely, about 2 hours. In the bowl of a stand mixer fitted with the paddle attachment or in a large bowl with a handheld electric mixer, beat the butter until creamy and pale in color, about 5 minutes. Sift the confectioners’ sugar and cocoa powder together in a medium bowl, then add half to the creamed butter and beat on low speed just until the sugar mixture has fully moistened then turn the speed up to medium-high and beat until well incorporated, about 3-5 minutes. Add the remaining sugar mixture and salt; beat on low speed just until the sugar has fully moistened then turn the speed up to medium-high and beat until well incorporated, about 3-5 minutes. Place one cake layer onto a serving platter. Add a generous amount of frosting and spread it to the edge with a spatula. Top with the second cake layer then cover the top and sides of cake with frosting. *Instant coffee powder can be used as well. **The butter for the frosting should not be melty. If the softened butter has an oily sheen to it, it’s too soft to make buttercream. Pop it in the fridge for a few minutes to firm it up slightly. I honestly fear that would ruin the cake texture and make it more like a brownie. You could try just leaving out the cocoa powder and adding a little extra flour in its place. I haven’t tried this myself so I can’t guarantee the results. Fantastic cake. I’ve tried making it with vanilla yogourt and just reduced the sugar a bit. Also didn’t have Red Mill flour as I live in Switzerland, but I used cake flour instead ( I just replaced two tablespoons of AP flour for every cup, with cornstarch).. I like that the batter is mousse-like instead of very watery. This is my new go-to Chocolate cake! I paired it with a whipped chocolate Nutella ganache frosting. Worked out great and everyone loved it!! Thank you! Thank you for sharing your feedback! I’m thrilled to hear the cake came out great with the changes you made! You can use plain yogurt or buttermilk in place of the sour cream. 3/4 cup of buttermilk should do the trick. Could I make your pistachio cake using this recipe for the chocolate cake? They’re both chocolate cakes so you could use any chocolate cake recipe you’d like. Thanks for this amazing recipe. It’s the best chocolate cake ever! Can’t wait to try out more of your recipes. The two 9 inch pans of batter have been in 350 gas stove oven for thirty-five minuets. The toothpicks come out very moist with chocolate liquid. What would cause it to still be raw in the center? I am afraid it is going to be dry if it ever gets done. I suggest getting an oven thermometer to double check the temperature in your oven. It sounds like it could be off. Made this yesterday and took to work today. Loved by all. Nice, moist texture and good flavour. Will definitely bake again. That’s fantastic news, Kayrn! Thanks for sharing!! This looks like the most amazing chocolate cake ever!